Perfect Drink Pro scale, cocktail shaker, and device stand. I went to the International Home + Housewares Show in Chicago in March, and after I got back, I had a lot of new friends who contacted me to see if I wanted to try their products. One of the companies that I was particularly interested in was the Perfect Company. I mean, how can you not love a perfect company, hmmmmm? This particular company was not at all on my list of places to visit at the show, but they were in the booth next to a company that was on my list. And when I saw the product, it was a "wow" moment. I wanted one. Perfect Bake and Perfect Drink are kits for making baked goods and drinks using an app-enabled scale. The kits also include a little stand for your phone or tablet. It seems like a little thing, but it made my phone much easier to read and use in the kitchen. The Bake kit includes a set of three color-coded mixing bowls and the Drink kit includes a cocktail shaker. There are two different current Bake and Drink kits - a Pro version and the standard one. The scale in the pro version has an integrated a timer, which is handy if you're using the scale independent of the app. The pro scale is more accurate (.1 gram instead of .5) and can handle a little more weight. It is made from stainless steel and has an LCD display. 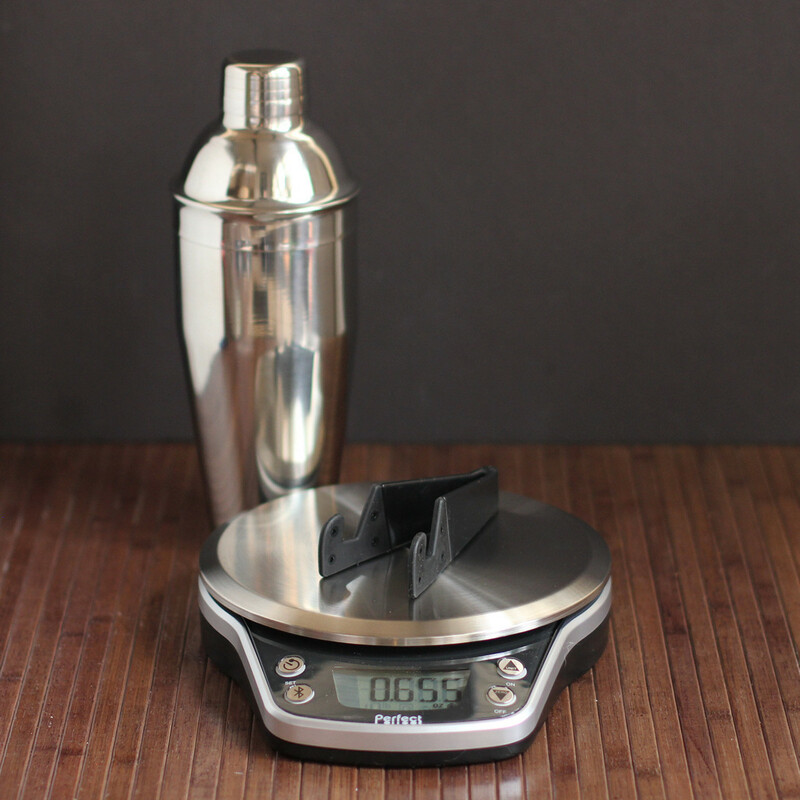 The other difference between pro and standard is that the pro Bake kit includes a thermometer, and the pro Drink kit includes a larger cocktail shaker. Note that the newest version of the kits is the 2.0 version - there are older ones still for sale in some places. Older scales were wired and plugged into your audio jack. All the new models are bluetooth. Once you have a scale, you download the app. And here's the first great thing. You can download BOTH apps, no matter which kit you buy. 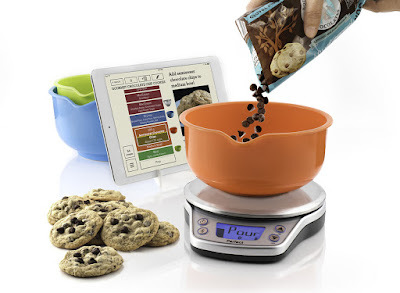 So you only need one kit and one scale to have all the recipes. Corn Muffins made from Perfect bake recipe. But wait, there's more! This is the most accurate scale I've ever used. If you blow on the scale, the scale detects. 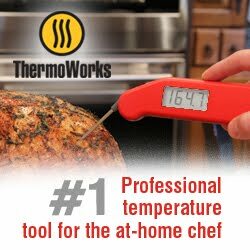 It needs to be that accurate because you weigh every single ingredient, including teaspoons of baking soda or salt. The scale reads in grams or ounces, your choice. I preferred using it in grams. But you don't really need to watch the scale, because the scale connects with your smart phone or tablet. There are little ... hmmm ... boxes in the app that fill up with color for each ingredient as the weight increases on the scale. When the amount is complete, the app beeps and the box turns red. Boom! Done measuring! It's really cool. It works well. You can tell how quickly you're pouring as you watch the little box fill with color. It even warns you in advance if the amounts are very small so you don't accidentally dump in a cup of baking soda instead of a teaspoon. But what if you totally screw up an add too much of an ingredient? Oops! Two eggs instead of one? The app scales the rest of the ingredients so that you simply make more of whatever you were making. 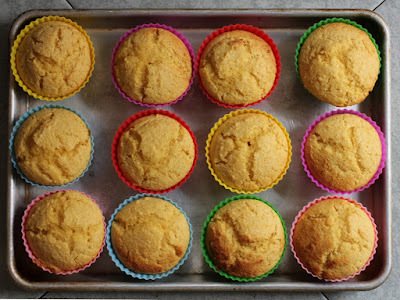 So maybe you end up with 14 cupcakes instead of 12 if you over-measured by a little bit. Or you have two dozen cookies instead of one dozen if you doubled an ingredient. You need to go back to previous ingredients to adjust, but it's pretty simple to see that. And then it also adjusts the servings to match your "overpour errors." So it will tell you that you made 1 1/2 cocktails instead of the one you intended. If you purposely want to overpour an ingredient - like if you want more rum in your drink - the best thing to do is add it last. You can add items in the order you want to in the app. Needless to say, for some recipes, the order you add things is important. For others, it's not going to make any difference. Oh, and the app lets you scale the recipe for however much you want to make. There are minimums and maximums, but there's a pretty big range. For cookies, you can specify the number of cookies. For pie, you can scale the size of the pie, so you can make a standard 9-inch pie, or you can make a tiny 3-inch pie. For drinks, I saw quantities as small as 1/2 drink or as large as 27 drinks, if you're planning a party. The app also includes a timer, so if you're supposed to mix or shake for 2 minutes, it times that for you. If you're using the baking app, of course it times the baking. And the cooling time. It's a step-by-step guide for everything that needs to be done. If you adapt a recipe, you can save the adapted version. You can also create recipes and save them in the app, including a photo of your awesome creations. And the recipe database gets updated. I'm not sure how often, but there was an update available right after I downloaded. You can search by ingredient or recipe name, and the recipes are also categorized different ways, so you can search for blended recipes, hot drinks, or holiday-themed, if you prefer. You can also tick off items you have in your "pantry" so you can limit the search to things you can make without going shopping. And if you're planning ahead, you can add ingredients from the app to a shopping list, so you can pick up those extra bananas you're going to need. Oh! And if you happen to have an ingredient that isn't in the app's list, you can add it. It has a LOT of ingredients, but you can for sure add more. If that's not enough to entice you to take a closer look at these products, there's a new app coming out later this year - the Perfect Blend - that you will also be able to download and use. To test the drink app ... well, I made a bunch of drinks. Adapted some. Added some. 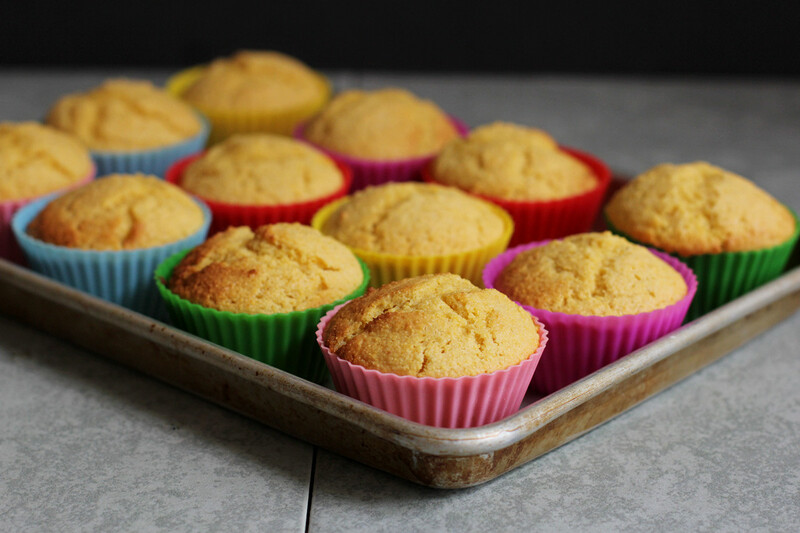 For the baking app, I decided to make corn muffins. What I really liked was that although the scale weighed everything as it was added, it also estimated volumes for things. So it told me I needed 1 egg or about 1 cup of buttermilk or whatever. That's particularly handy if you're checking in the fridge to see if you have enough of something. 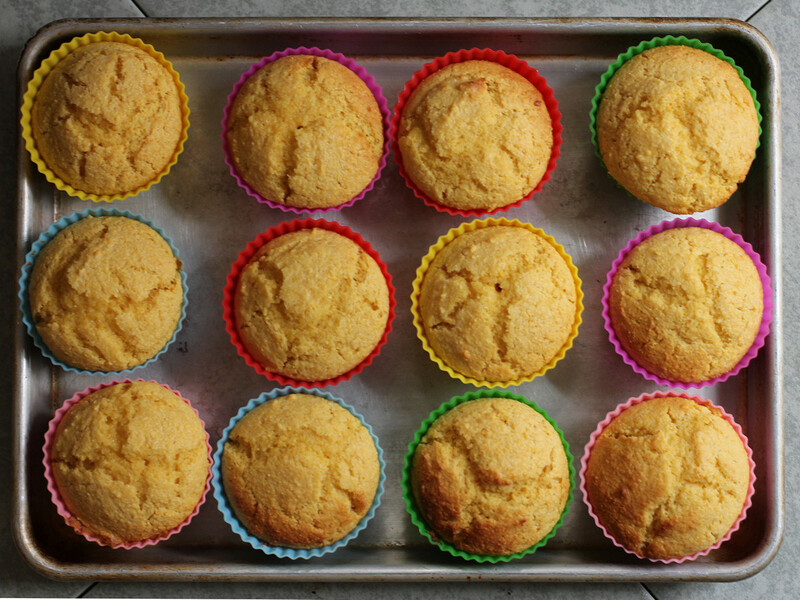 To test the baking app, I made corn muffins. Not only was the app really cool to work with - no need for measuring cups or spoons at all - but the muffins were really really really good. I thought it was interesting that not only did the app weigh all my ingredients, it also told me to put muffin cups on the scale one at a time to portion them evenly. Who's it for: I can see several different audiences for these. First, people who aren't as adept at cooking, but like technology. The app tells them step by step what to do, and the recipes I tried and the others I read were really easy to understand. Second, people who like to cook and like technology might like this app. I'm already thinking about the different recipes of my own that I could add so I don't have to look up them up every time I make them. As far as the cocktail app, I've been having fun playing with it, so it's fine for making one drink at a time. And nice to be able to make drinks without using jiggers and measuring cups. I also think it would be great for parties. People could make their own drinks using the app, working from the recipes where ingredients are in the pantry. Or a designated bartender could make drinks using the app, without having to know a whole lot of drink recipes. How cool is that? Pros: The apps work well. The scale is awesome. You can add your own ingredients and recipes to the app. Cons: The pro version is a little pricey, but the scale is more accurate - I think it's worth it, but you might be just as happy with the regular. Details about the differences are on the company website. Wishes: I'm pretty excited about this product ... I think the only thing I'd like is a way to run the app on a Windows device.